Renowned author Ethan “Mighty” Casey will be traveling to Detroit for the 28th Annual Babe Ruth Birthday Party at Nemo’s Bar in Corktown this Saturday, February 7, 2015. Casey, coauthor of Queen of Diamonds: The Tiger Stadium Story, will be giving away 714 copies of his latest book, Home Free: An American Road Trip. Casey, based in Seattle, devotes an entire chapter of his latest book to Detroit. 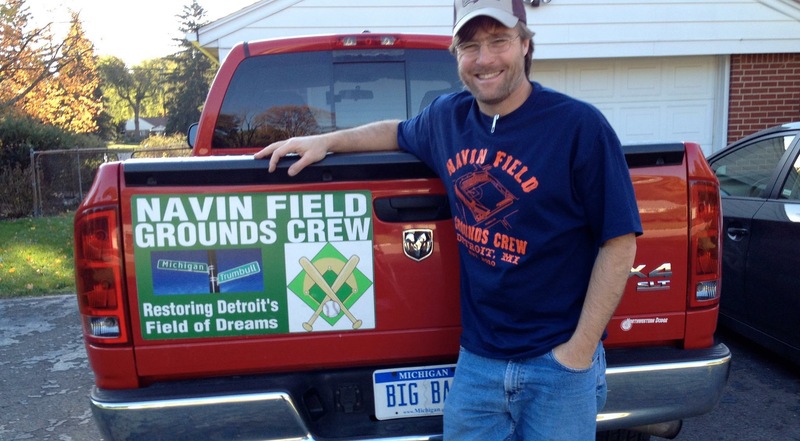 He writes passionately about the fight to save Tiger Stadium, and the recent efforts of the volunteers of the Navin Field Grounds Crew, who have cleaned up a 9.5 acre lot filled with giant weeds and trash, and turned it back into a field of dreams. Casey, who wrote about the Babe Ruth Birthday Party last year in The Huffington Post, attended his first bash in 1991, when it was held at the Dearborn Heights home of Tom Derry and Kevin Donner. Twenty-four years have passed since that party, and Casey is ready to swap some old baseball stories and live large like The Babe. So come on down to Nemo’s this Saturday, FebRUTHary 7 at 7:14 p.m. Grab a beer and and a hot dog and talk baseball with the “Mighty Casey.” And be sure to get your free autographed copy of his latest book. We’re honored to have Ethan Casey at this year’s bash.